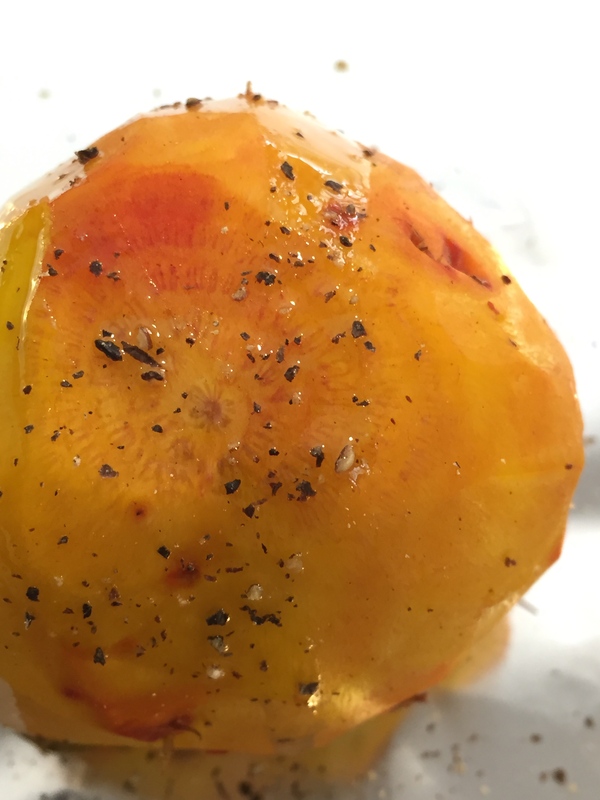 Roasting beets intensifies their flavor, brings out their earthy sweetness, and makes their peels as easy to peel off as an over-sized sweater. Like roasting any vegetable, it’s pretty simple. 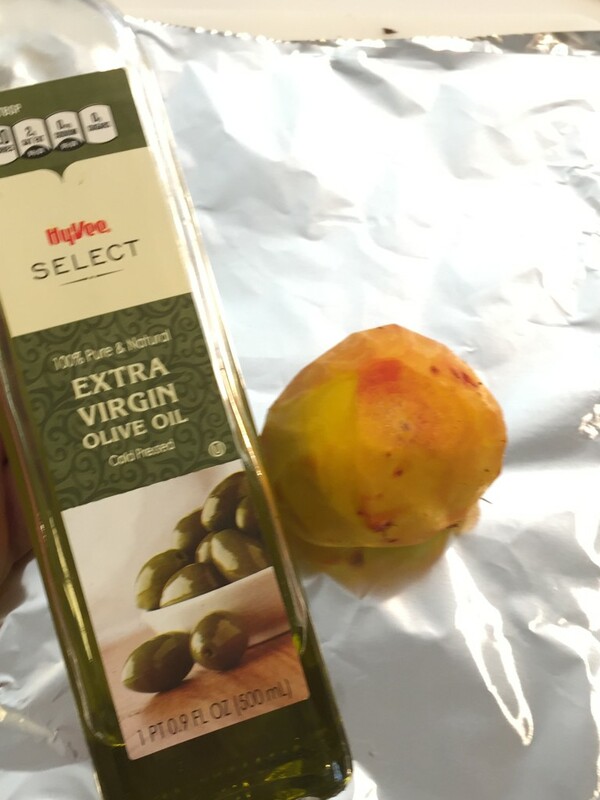 OK… to peel or not to peel, that is the question. 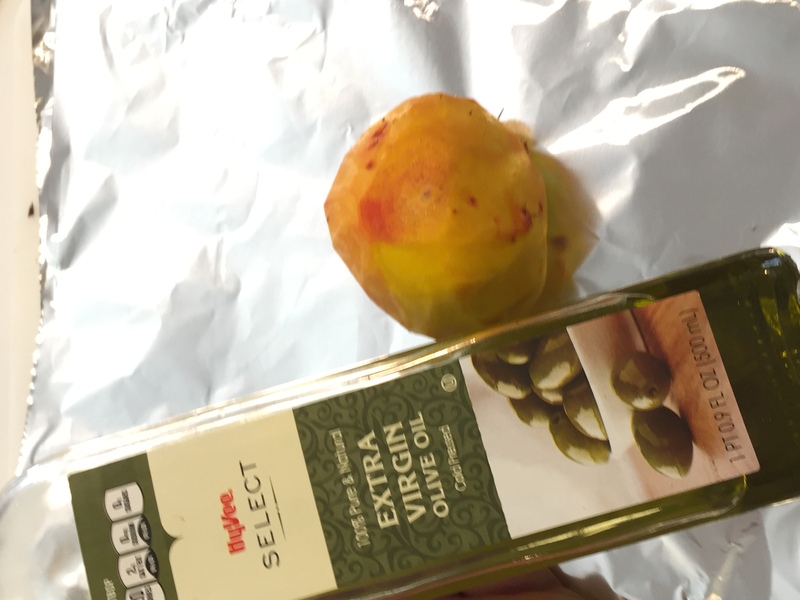 To Peel,the pros- Your done with the preparation, the olive oil and the pepper absorbs into the beets better. To Not to Peel-the con’s- Your hand get don’t get nice and stained red. The skins can be tough to peel. Here’s my easy roasting guide that will make you an expert. Start with beets that are firm. 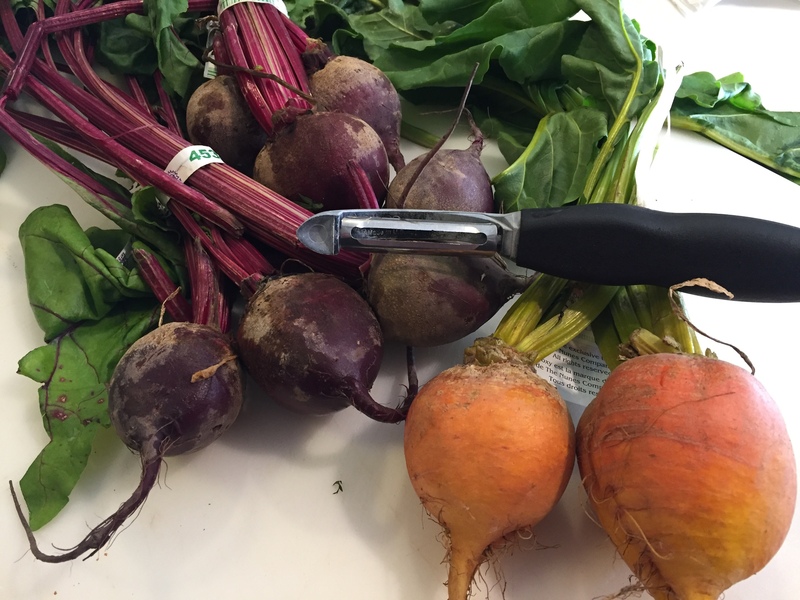 If the beets came with their greens still attached, as pictured above, cut off the greens and the root end and wash them, some folks keep the greens for other uses. Drizzle the beets with a bit of oil before roasting. I like to use olive oil but grapeseed oil or canola oil work just fine, too. 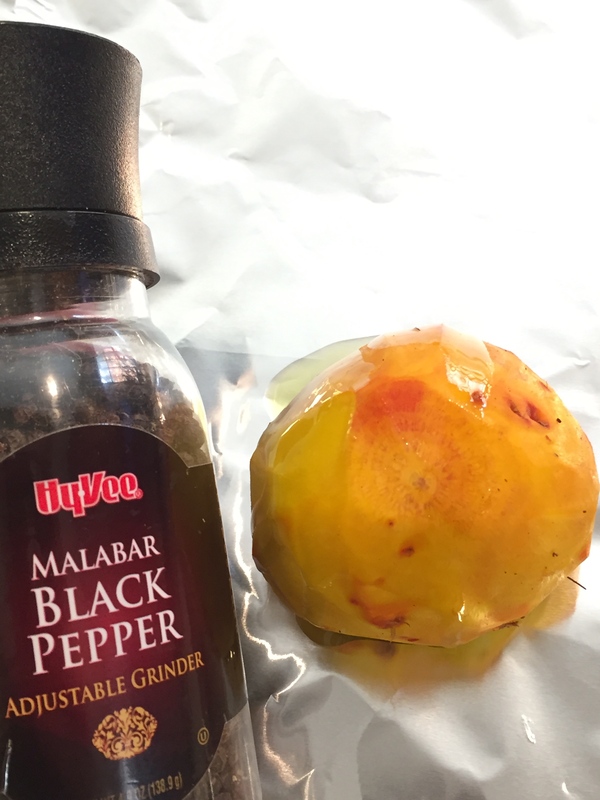 Sprinkle the beets with pepper too, if you like. For an even roasting of the beets, fold the foil over them and crimp to seal the sides closed. This helps keep them moist, it also helps contain the staining juices make clean-up a snap. 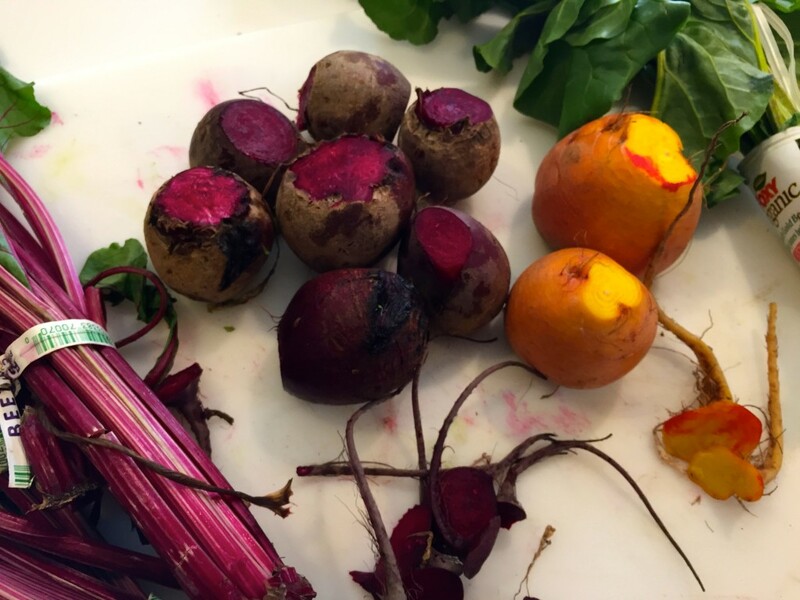 For smaller beets, start checking them for tenderness after they’ve been roasting for about 25 minutes. Larger and older beets can take up to an hour. Remove the beets from the oven when they’re tender (you should be able to easily pierce them with a knife). 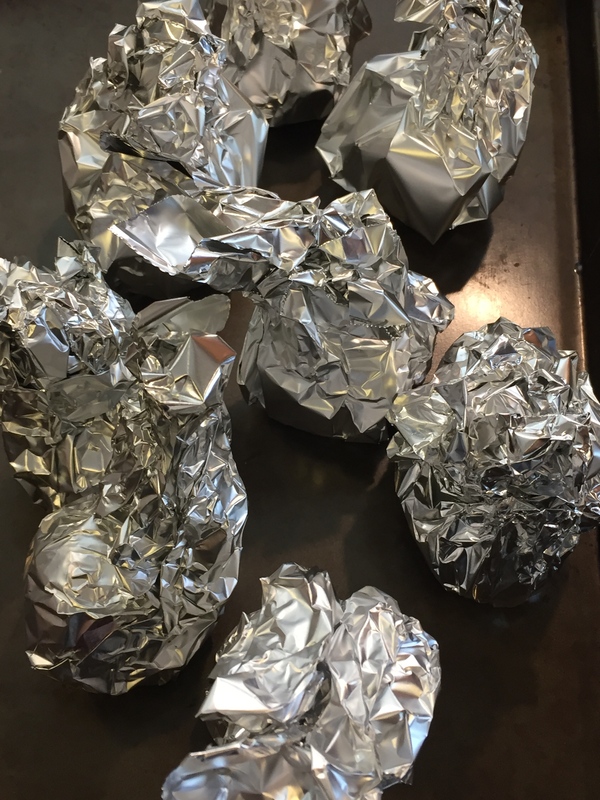 Open up the foil packet and let them sit until they’re cool enough to handle. 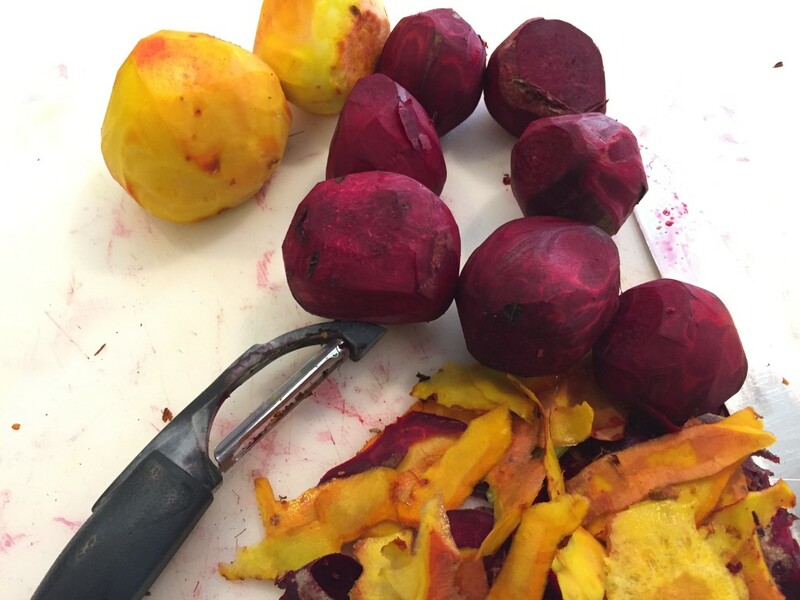 Roasted Beets, Ready to Serve! Coat beets lightly with oil. 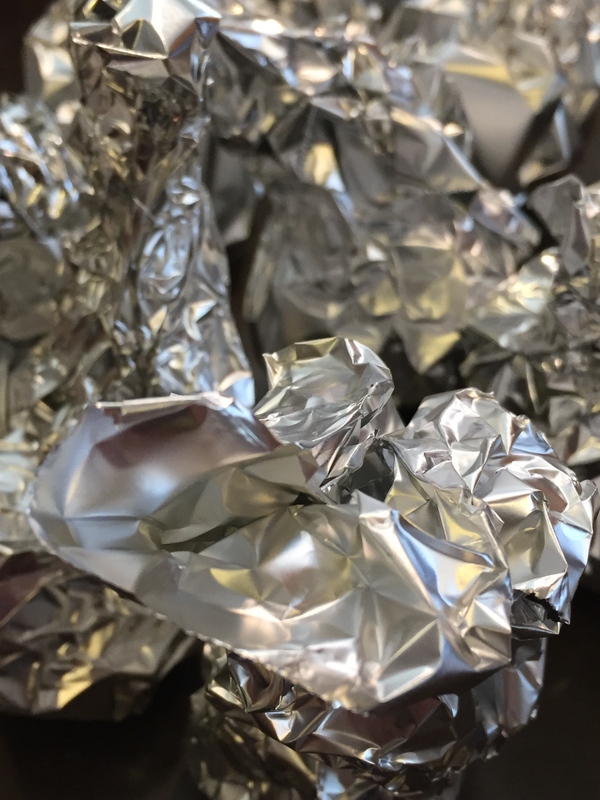 Wrap beets in aluminum foil, place on a baking sheet, and roast in the oven until cooked through, approximately 45 to 60 minutes. 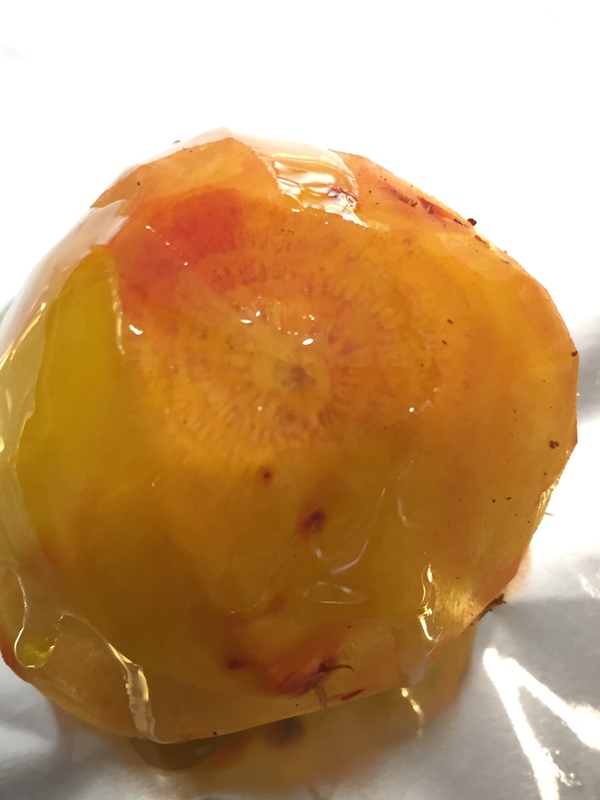 Remove from the oven, let cool for 10 minutes, and then peel and slice into 1/4-inch thick slices. In large bowl whisk together balsamic vinegar and honey. Add the pepper, mustard and garlic whisk until well blended. While continuing to whisk, slowly add the olive oil. Place in refrigerator until ready to use. Separate goat cheese into 10 equal portions; roll each portion into a ball and flatten to create patties; coat each goat cheese patty with chopped walnuts. Arrange the greens on a large platter; evenly drizzle Honey Balsamic Dressing over arugula. 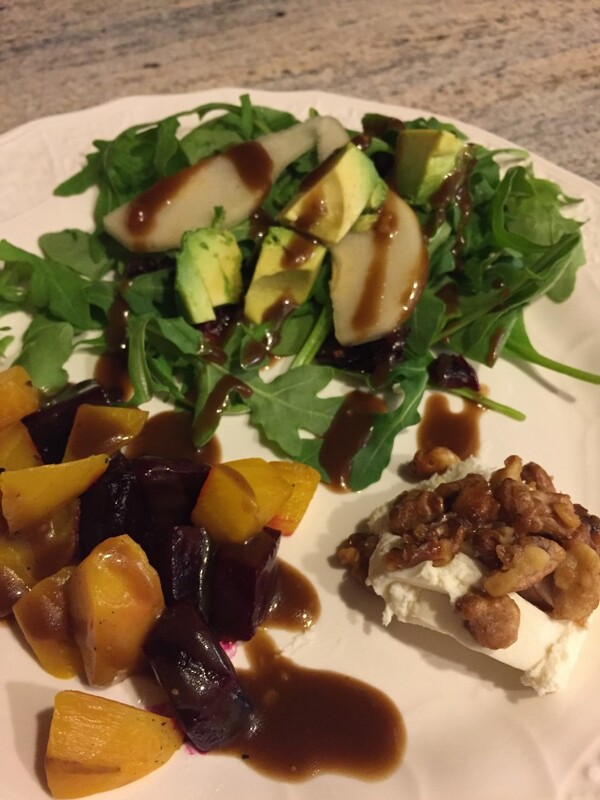 Spread the fresh roasted beets, avocado and cranberries evenly across to top of the arugula. 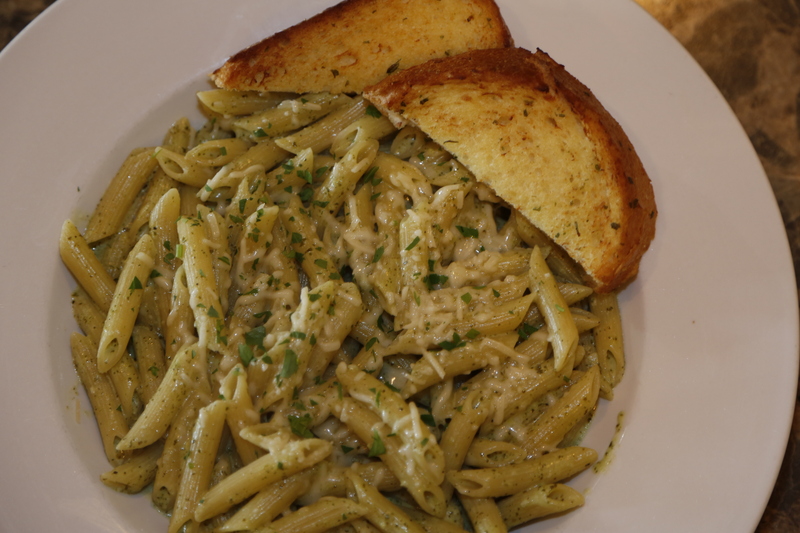 Place the pieces of goat cheese down the center of the plate. Garnish with cracked black pepper and serve. ← Eating Better: We Need a Plan!